October 18 is an annual celebration of Persons Day in Canada. This holiday is connected to the case of Edwards v. Canada, which is commonly known as The Persons Case. In the beginning of the 1900s Canadian men outnumbered Canadian women, that resulted in alcohol abuse and prostitution. This motivated women to fix the society and obtain role in politics. In 1916 Alberta passed legislation, that granted women right to vote. But the Act contained the word “person”, that caused an issue. The word “persons” was used when talking about more than one person, and “he” was used when talking about one person. This meant that the Act granted right to vote to men only. 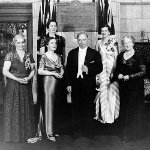 Five Alberta women Emily Murphy, Nellie McClung, Louise McKinney, Irene Parlby and Henrietta Muir Edward filed an issue, where they asked, why women were not included in the word “person”. Two years later they won the case. This helped women not only have a place in the senate, but it gave them more rights and equality. Persons Day in Canada was proclaimed in 1979, on the 50th anniversary of the decision. The Governor General's Awards in Commemoration of the Persons Case was instituted in Canada to recognize outstanding contributions to advance equality for women. Every year the Awards are presented on Persons Day.